"Joan was an Angel on earth. She was always happy to see me...."
"Mrs. Blair was my favorite teacher, she was always so..."
"I am sorry for the loss. You can be assured that she will..."
"Joan was a wonderful teacher to my children at Ben Franklin..."
"Joan was an inspiration to all who had the privilege of..."
Joan Marie Blair, 70, passed away on March 25, 2019 at her home in Vancouver, WA, surrounded by her loving family. She was born on July 2, 1948 in Portland, Oregon, the middle of three daughters born to John M. Priel and Norma Lee (Hollenbach) Priel. Joan spent her first twelve years in north Portland before moving to Vancouver in 1960. She graduated from Ft. Vancouver High School In 1966 and went on to earn a teaching degree at Central Washington University in 1970. Joan later earned her Master’s degree at Portland State University in 1974. In the fall of 1970, Joan started her teaching career with the Vancouver School District. She taught K-3rd grade for 26 years at various schools. Joan was teaching at Peter S. Ogden School in 1972 when it was destroyed by a tornado. Joan loved teaching the younger children and, during her career, she was awarded a Lifetime PTA membership for her commitment to that organization. 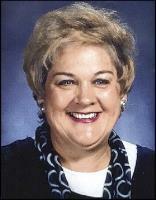 Joan also received the Elsie M. Johnson award and was named one of the top 150 teachers in VSD history. After retiring from public school teaching, Joan served for six years as a Field Supervisor for education degree students at City University. She was active in the community as a member of the Lady JC’s. Joan served on the Board of Directors for the Miss Washington Scholarship Pageant and was active in the Claudia Swanson Chapter for Doernbecher Children’s Hospital. Joan’s church family was very important to her. She was the church’s moderator when she was diagnosed with cancer in 2013. Joan enjoyed working in the kitchen at church with good friends preparing meals for church activities. As an honor to her, the new kitchen at church was dedicated in her name. In her last years at church Joan was a member of the deacons. Joan loved to play cards and games. She played in various bridge groups over a span of 40 years. Joan played Pitch and Mah Jongg on a regular basis as well. Best of all, she enjoyed playing Uno with her grandchildren. In her last years the center of Joan’s life was her grandchildren. She loved watching them grow and participate in various activities. Joan said that her only regret was not being able to watch them grow to adulthood. Joan is survived by her husband of 46 years, Claude; her mother, Norma Lee Priel; two daughters, Betsy (Mike) Volm and Emilee Neyens; two sisters, Jai Hari Kaur Khalsa and Jean (Dave Orthmeyer) Priel; and three grandchildren, Parker Neyens, 14, Mackenzie Volm, 11 and Rylee Neyens, 10. She was preceded in death by her father, John Priel; and her sister-in-law, Dana Blair. A memorial service for Joan will be held at Vancouver United Church of Christ, 1220 NE 68th Street, Vancouver, WA on Sunday, April 14, 2019 at 2:00 p.m. Contributions may be made to the Memorial Fund at Vancouver UCC.